After a long development program the new Taxi of Tomorrow is ready to hit the streets. A look at what the customers, cabbies, and the city officials think of it. In just a few short months the New York City Taxi of Tomorrow will begin to take fares all over New York. The long awaited start to this program is now in sight and in its final tour of the city the Nissan NV200 impressed all the stakeholders. Those include cab owners, cab drivers, cab customers, and those concerned about the environment. The Taxi of Tomorrow program was a contest. Simply, it challenged automakers to improve upon the current Taxi standard, the Ford LTD rear drive, body-on frame antique that plies New York’s streets by the thousands. The general idea was to standardize on one vehicle so that economies of scale could be realized, thus saving money. By controlling the process the City of New York also was able to ensure that the resulting choice would improve upon the fuel usage and emissions of the past cabs and be a platform that could accept greener drivetrains as electrification became more mature. Nissan is excited to have the contract and has already started inroads in other major international cities, such as London, with the vehicle. As the video shows the new cab has easy ingress and egress, a touch screen the passenger can use to access information and many more user-friendly features. 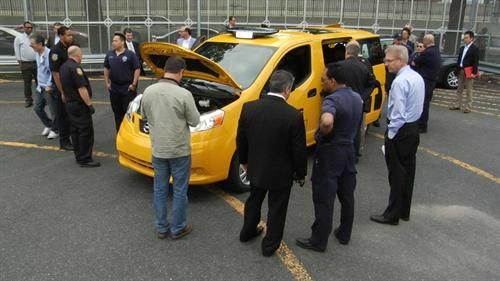 This is also the first cab in New York to be crash tested with the customers in mind. According to the city of New York about 600,000 cab rides are given in the city each year. The NV200 is safe, comfortable, and has tons of luggage space. Nissan has also done some beta testing on the Nissan Leaf electric vehicle as a taxi which does not have these attributes. Starting this fall the look and feel of New York’s taxis will have a dramatic change for the better.